I was told that as a mere commoner, it was an opportunity of a life time to step through the light sage door of Club 33 and be transported into the exclusive membership only club within. So when I was invited to join a bunch of people for brunch one Sunday morning, I leapt at the chance. I hate going to Disneyland and when I heard that the only way into Club 33 was through the park, my heart sank. I had made it a point not to visit “the happiest place on earth” after my last visit 12 years ago due to rather unpleasant memories and it certainly never was a happy place for me. However, the lure of dining in the exclusive Club 33 was enough for me to push those negative thoughts aside and make an exception to take a look within. My friend Holly (Savored) and I arrived at the parking lot with plenty of time to spare, but somewhere between the shuttle and picking up the tickets from Guest Relations (not Guest Services which we first went to) to battling the crowds and strollers to Club 33, we had spent a good 45 minutes and found ourselves standing in front of the green door somewhat flustered. It took a while for them to confirm everyone standing in front of the door trying to get in, but after that, a small entrance way with a flight of stairs lead you into what Walt Disney probably saw as his magical introduction for those special guests lucky enough to experience this. There are two dining rooms, the Main Dining Room which was more spacious and larger, and the Trophy Room, where we were seated. This was a room of yesteryear with dark wood paneling and felt like a room gentlemen may enjoy congregating in. Our meal began with a vist to the appetizer buffet which wasn’t very big. 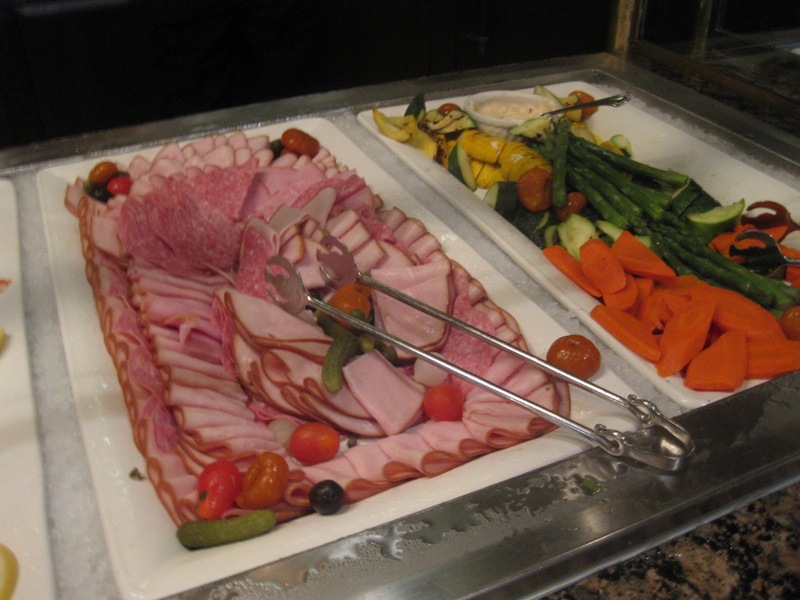 In fact, I was expecting the type of buffet I was used to in Asia consisting of a huge spread of luxurious foods, but instead, there were a few salads, a tray of cold cuts, crab claws, lobster tails and shrimp cocktail. What made up for the lack of choice was how everything was fresh and of the best quality. The cold seafood was delicious with great flavors and the best part was you could go back for more. There is also a soup of the day — carrot and ginger on our visit — which was fantastic albeit served a little too cold for me since it was sitting in a self serve dispenser and not in a steam table tureen. Since we were in a large group we had to pre-order our entrees and right after they placed our entrees on the table, our server took center stage and started giving us a speech about the history of Club 33 and now, everyone was politely listening to her and neglecting their entrees. The speech took a good 15 minutes by which time our entrees had grown cold. To make matters worse, Holly and I both ordered the chateaubriand which was burnt on the outside and overcooked on the inside. I found it strange that such an exclusive place failed to ask us how we liked our meat cooked and the 6 in our party who ordered the steak had varying temperatures of steak depending on how thick the piece was. It was as if they had cooked everything for the same amount of time so our two thinner pieces were overcooked while the thicker slabs were either too raw or done just right. Holly and I took two bites and pushed our plates aside and hit the seafood buffet again. Service up till now had been immaculate. Plates were promptly removed, water and iced tea refilled, smooth sailing all around. After the speech everything went downhill. Dirty plates were left on the table, water glasses empty, and by the time dessert rolled around it had gone way awry. As each person in our party proceeded to the dessert buffet and returned with plates of sweet treats, some were offered coffee and some were not. Holly and I were those who were not. We had to ask our server and when I asked for tea, she said “black, green or herbal”. I told her herbal and she came back with a pot of Orange Spiced tea. I thought it presumptuous that she just chose a particular tea for me. Usually, a selection is brought to the table and I get to select what I wanted. What if I didn’t like Orange Spiced tea? I mean, I did like it, but what if I didn’t? That wasn’t really the point was it? I’m not being ungrateful here, but for a price tag of $117, I had seriously expected a little more. A little more from the food, a little more from the service, a little more of well, everything. Still, I was glad I came because I’m not sure if I would return again, or if I’d ever get the opportunity to, and even though the food and service didn’t completely meet my expectations, it was definitely an experience, one which everyone should get to try, once in a lifetime! >Very good recount of our less than mindblowing experience there. I liked what you said about the tea — $117 should at least get you a choice of which kind. Also, I wasn't all too jazzed I had to stir my coffee with my fork I used for the seafood buffet. >I'm glad I got to experience it, but yeah for the price, I really did expect more. Holly and I both did not eat our entrees…. we just attacked the seafood buffet again. I'm not thrilled about eating food that doesn't taste right/good and wasting valuable stomach space. >You are the second person whop has been there recently and told me they were underwhelmed to say the least. Sounds like they haven't kept their game up as standards have been raised elsewhere. >a brunch at $117…i expect everything to be mind-blowing! >I've been to Club 33 twice. Once for dinner and once for the breakfast buffet. It's okay and not worth the money. The food is definitely not great. You go for the idea it's very exclusive. Meh.